The common knapweed has the nickname of Hardheads. If you pinch off an old flower head in the autumn, pull off any loose seed heads, there is a very hard kernel. If you then carefully split this there is a good chance that there will be a small grub inside. Goldfinches can often be found feeding on these grubs. This plant can survive for years in both grazed pasture and neglected grassland areas. Flowers are pollinated by a wide range of insects including bees, flies, butterflies and beetles and the seed heads attract goldfinches and other seed feeding birds. Distinguishing Features: Common knapweed is a tall, thistle-like perennial that prefers low to moderately fertile soils yet it does not like wet areas or acidic soil. Knapweed is a dull green plant entirely covered with small, rough hairs. Upright stems are branched at the top and the stems are ribbed, and sometimes as they age they become hairless. 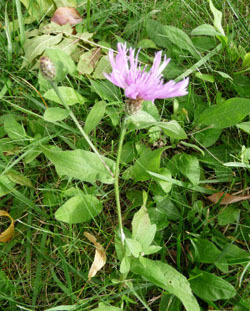 Knapweed reproduces by seed and can regenerate from the crown as well as by perennial root spread. Flowers: Flower heads occur at branch tips. Bracts at the base of each flower head are covered with dark brown or black fringed margins. Flower heads are made up of 40 to 100 purple (or rarely white) ray flowers. Depending on geographical location flowers bloom between June and September. 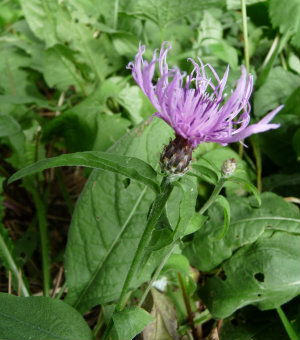 Fields of Nutrition has medicinal benefits and vitamin/mineral content of Knapweed. 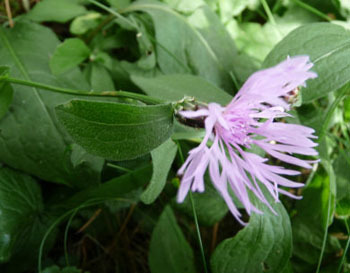 Leaves: Knapweed leaves are alternate, lanceolate, and pale green. Lower leaves may be toothed. Some leaves can grow up to 25 centimetres long. Height: This perennial plant (on average) grows to just short of one metre (just over 3 feet) high. Habitat: Habitats include pastures, meadows, roadsides, field borders, waste areas, and woodland edges. It does not like shade and is drought resistant. This plant can be found in six Canadian provinces, about thirty states, parts of Europe, and the southern areas of Australia. Edible parts: Only the flowers are edible. This plant has some medicinal purposes.